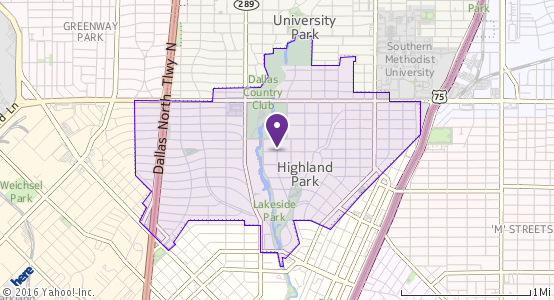 Located 3 miles north of the center of Dallas, Highland Park is an affluent community that is nestled between Dallas North Tollway and U.S. Route 75. Conveniently, Highland Park is only 4 miles from Dallas Love Field Airport, and a 30 minute drive to DFW International Airport. The city offers multiple variations of commuting from its proximity to major interstates as well as the DART Rail. Although Highland Park has become ultra-modernized in development, it is a town that is rooted in its rich history. With an annual tree lighting, public swimming pool, a library, tennis courts, and the Dallas Country Club, Highland Park is a family orientated destination to make its 8,500 residences feel comfortable in the midst of a bustling city. Awarded with a well-deserved excellence of achievement, Highland Park is a suburb of Dallas that has truly set the standard for North Texas. The Shops of Highland Park and Highland Park Village feature some of Texas’ most modish shopping and upscale dining. With so many one of a kind opportunities unique to just Highland Park, this is a superior city that has a special touch for everyone. The Highland Park Independent School District is ranked number three out of 937 school districts within the state of Texas and sets its foundation in a rooted commitment to excellence in academics, arts, and athletics. A mission of HPISD is to empower each student to become an eager lifelong learner committed to academic excellence, integrity, responsible citizenship and service to others. This district encourages its students to, “Enter to Learn. Go Forth to Serve.” HPISD is an excellent and unprecedented district that is truly one of a kind.